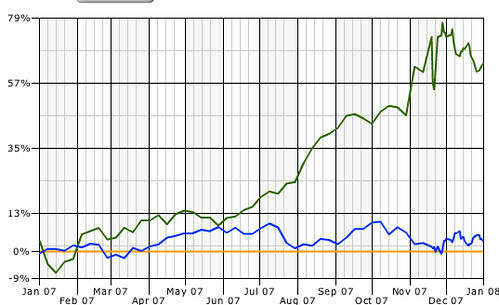 My US Share portfolio (green) in 2007 was up 63.5% versus the S&P500 index return of 3.53%. A great year, and I did sell down a bit around the peak, which hit 77%. This year to Friday the 28th of March – I’m up just 12.6%, but the index is down 10.4%. so you could say I’m 23% ahead, but that’s today. I’m publishing this after a good run – things can turn quickly, as I found in late Feb.
For the story of last year, check my previous missives – the last one when the portfolio was up 72%, and I also talk about getting out of eBay (at $39 – they are now $30, visited $25) and Apple (at $163, now $143 after visiting the $115 range). While the Apple shares initially went up, they then went way down, while the eBay shares just went down. In retrospect it was great timing – and based on some news that had come out for each company, and a shaky market based on the cheap debt crisis. However I screwed up by buying more Apple shares last year when they were still really high, but made up for it by buying a bunch of eBay shares this year when they were very low and some Apple shares and options when they were low as well. 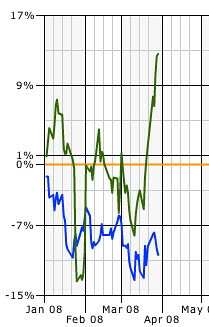 I got a little too levered in February this year – so the green line shows a lot of volatility. I’ve since lowered my leverage. I’m still, as always, very short Microsoft – both with short selling the stock and with options. I’m hoping the merger with Yahoo! goes through as the combination is not good and should see more value destroyed. MSFT has dropped from $34 in the last post to $28 now – a healthy return for those put options especially. I’m still short Equity Residential – a rental property owner, but I did sell out of them completely earlier this year, and am getting back in as (over) confidence is returning to the markets after the Fed movements. I’m believe there is a good chance that the recent interventions are band-aids, and there are plenty more bad stories to come. Being long and short means I’m less exposed to the violent market fluctuations, but I am exposed to days when things are rosy for Microsoft and bad for eBay and Apple. I’m betting the reverse is more common. Finally, in a down market it pays to go to companies that sell basic stuff – so I’m following my own advice and I’ve invested for the first time in Berkshire Hathaway. I expect to build up my holdings in Warren Buffet’s company – it is a long term buy and hold in a down market. All this is in USD of course, and the currency has subsided a bit. The amounts are nothing special, but I’m having lots of fun.